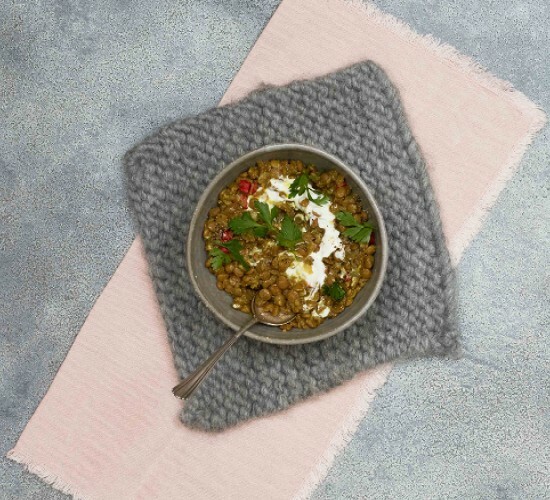 When the weather takes a colder turn, what better way to keep yourself warm and nourished than with a hearty green lentil dhal. Not only is it feel-good food at its best, but this Indian-inspired dish boasts an impressive nutritional profile. Turmeric, ginger and chilli are all high in antioxidising and anti-inflammatory compounds, while lentils are full of heart-healthy fibre, folate and magnesium, which can help to stabilise blood sugar levels, aid digestion and lower cholesterol. Whether you’re trying to eat less meat and need some vegetarian inspiration, or are just looking for a delicious, warming staple to add to your repertoire, this simple green lentil dhal is a recipe that never disappoints. With the back of a knife, crush the garlic cloves and ginger and then finely slice. In a deep pan heat up the coconut oil and add in the red onion, garlic, ginger and chilli. Sauté for a few minutes on medium heat until the ingredients have softened. Crush up the coriander seeds in a pestle and mortar and add into the pan along with the turmeric powder. Stir well, then add in 1 litre of the vegetable stock and bring it up to the boil before adding in the lentils. Cover the pan and let it simmer on medium/low heat for half an hour – stirring regularly to help the lentils absorb the liquid. Add in a further 500ml of hot water and leave it to cook for a further 15 minutes until the lentils have softened. Season well with salt and cracked black pepper to taste, and serve your green lentil dhal with fresh parsley.